I’m one of those sewers who buys fabric first, and then figure out what to do with it later – much to the test of my partner’s patience! 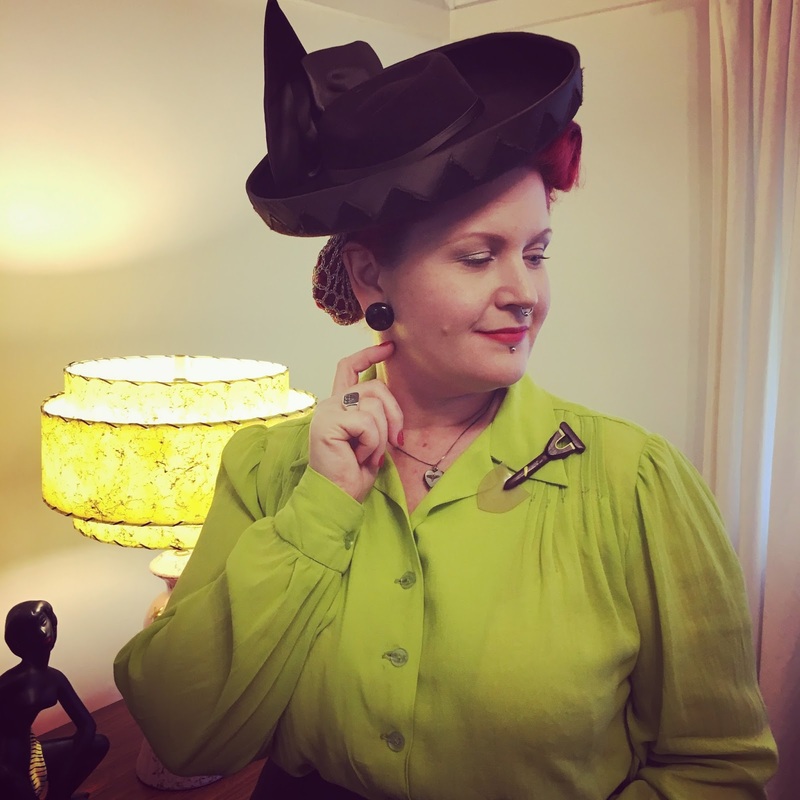 Of all the colours popular in the 1940s, chartreuse is my favourite. 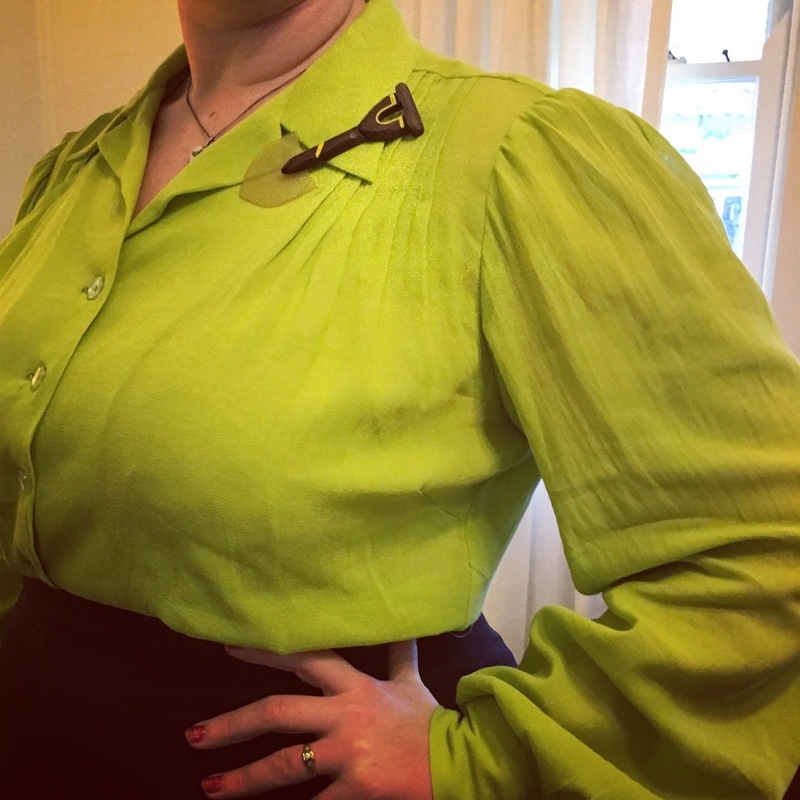 Just recently I found the most bonkers chartreuse rayon georgette at Remnant Warehouse and knew it needed to be a blouse, ASAP. 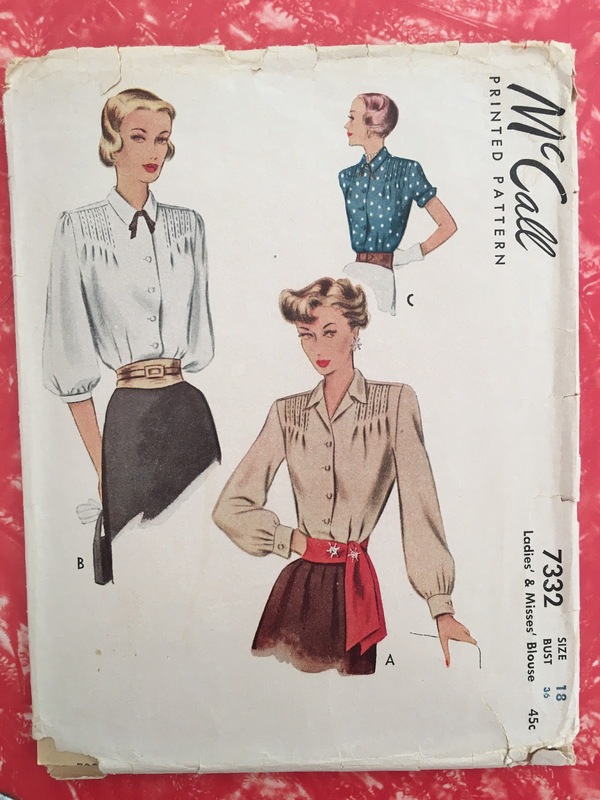 The pattern is McCall 7332, from 1948. Originally I was going to make Version B with the 3/4 sleeves but I can never get them to sit right – does anyone know how to stop them sliding down? Long sleeved version A it is then! The pattern only uses 2 1/2 yards of fabric (about 2 1/4m) which is a lot of bang for so little fabric. I really like the little tucks on the chest, it’s a quick detail but makes the blouse interesting to sew. Apologies for the washed out photos, my camera did not like the brightness of the fabric. The pattern is sized for a 38 inch bust – and I made no changes to the sizing to fit my 42″ bust. I did make one mod – it was to cut a larger sleeve head so I could gather it for a slight puff. Honestly, I’m lazy and hate fussing around setting sleeves. 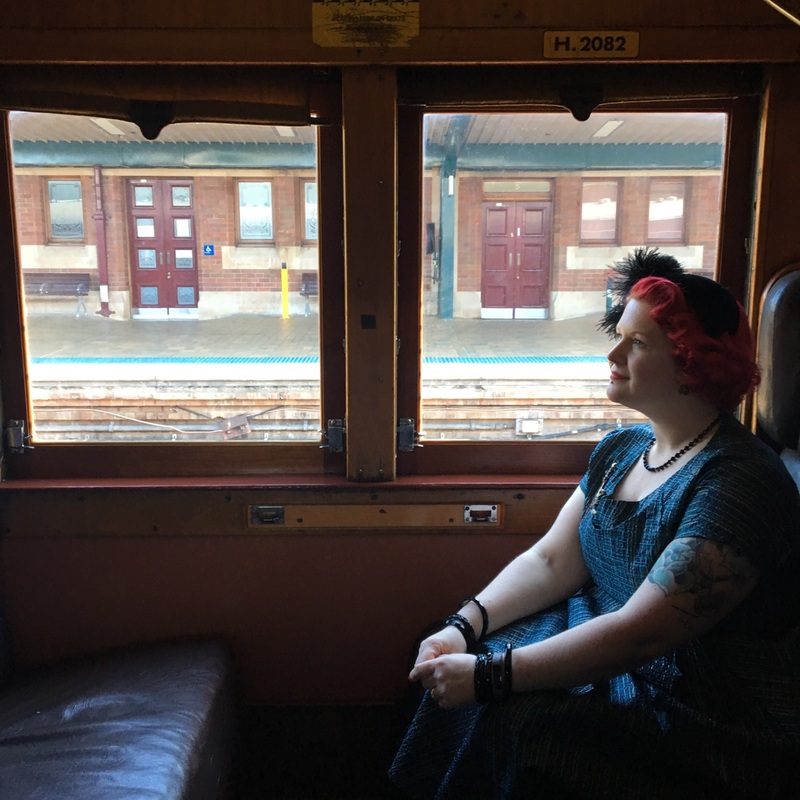 This weekend we also took a trip to see the steam trains at Transport Heritage Expo (yay for the Queen’s Birthday holiday). 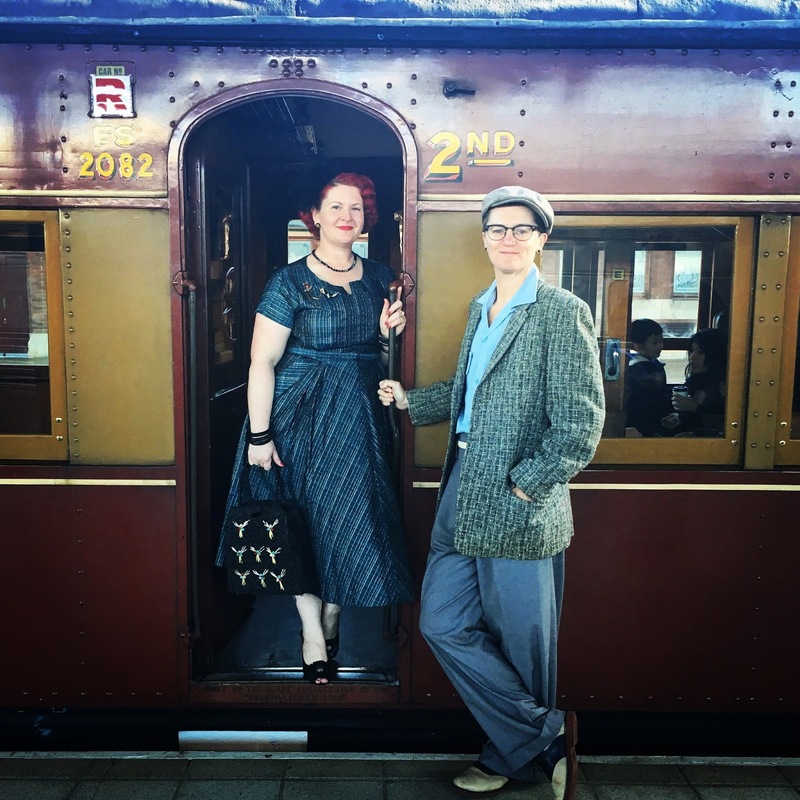 Jakk and I are both fans of old buses, trams, planes and trains – I count myself really lucky to find someone else who gets as excited as I do about vintage transport. Jakk is still recovering from breast cancer surgery, so it was nice to do something gentle but fun. 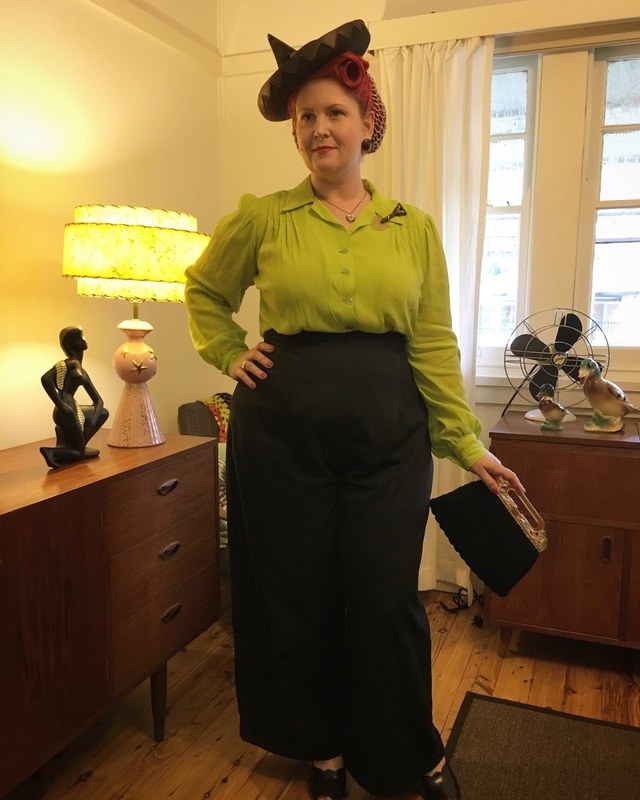 And dress up in our best vintage. 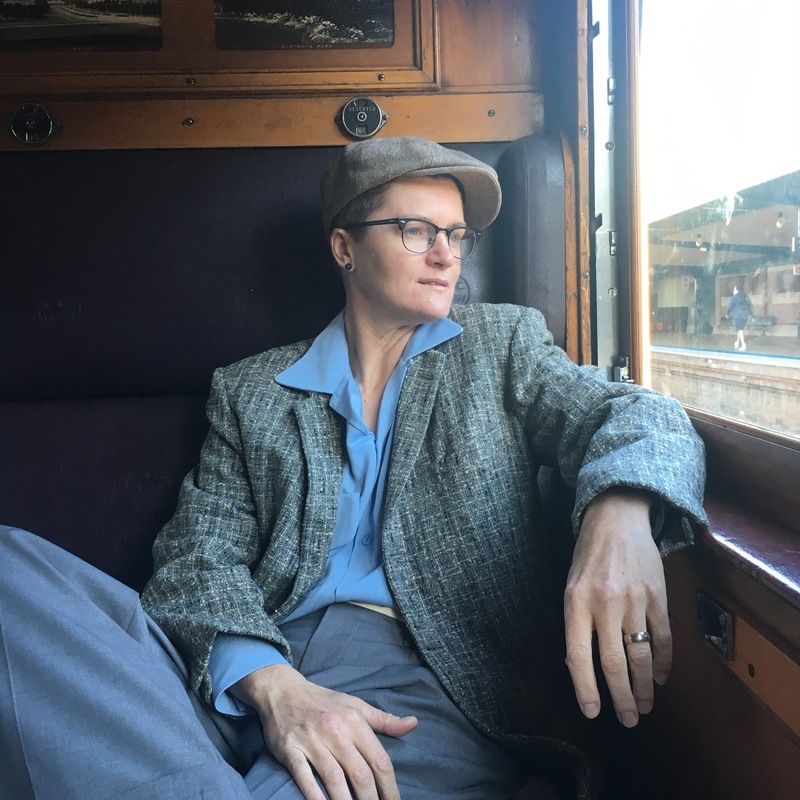 We took a steam train ride from Central Station to Hurstville – it’s amazing that these old trains still work and can get passengers around. 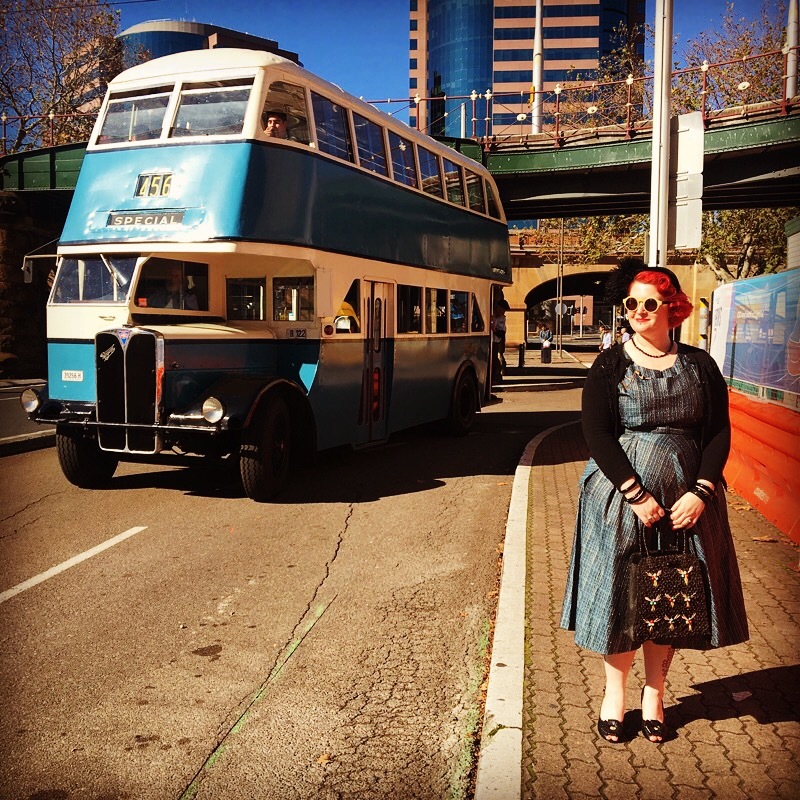 The Sydney Bus Museum had their old double-deckers running too, taking free trips around the Sydney CBD. Sometimes, I think Sydney can be really boring and sterile (compared to other cities, like Melbourne or LA) – and then I find events like this and I wouldn’t live anywhere else! Next Post Curvy Month is coming for 2017! The blouse is fabulous. We enjoy vintage transport as well. Sending prayers and hugs to Jakk as she recovers. 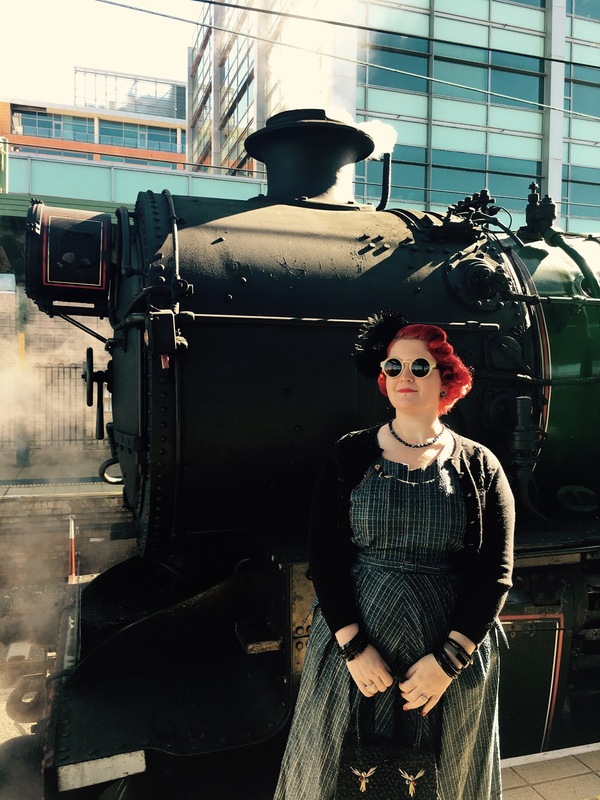 Love trains and love that blouse! I also love those bright colors, but sadly, the 'greeny-yellow' are in the hues that don't suit my complexion. So fantastic tho'!. And much Peace and Light to Jakk on a successful result from surgery and speedy mending. Great blouse and an amazing Color! Hope you had a wonderful day in the old train and I wish you both all the best for Jakk's health. I was diagnosed with cancer myself two years ago, so I know how you two must feel. I face the same problem with 40s patterns, that the sleeves slide from the shoulders due to the placement of the shoulder seam. What I do is to attach a cotton ribbon on the inside of the highest point of the sleeve (so not on the shoulder seam, but in front of it) and on the inside of the collar, the ribbon should be a little shorter than the fabric on the shoulders, but not too much. Like this, the sleeve cap stays in place and the fabric of the bodice is not stretched by its weight. Lovely blouse! The color looks fantastic on you (not everyone can pull it off!) Lovely pics of the train, too. Looks like a nice time. Hope Jakk recovers quickly! |Great sewing.. Sorry to hear about Jakk. I had BC a couple of years ago so I wish a speedy recovery for Jakk. so sorry to hear about Jakk. Hope he recovers soon. I really like the blouse. fabulous job. the color is looking so good on you. The pics are looking so vintage.. 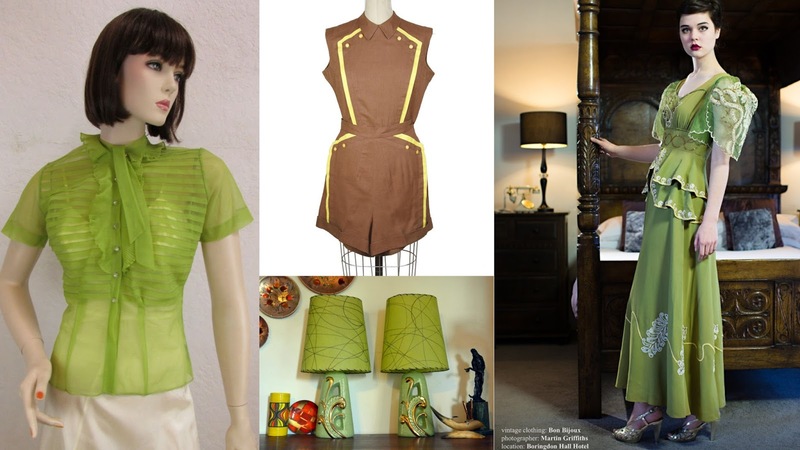 Stunning colour blouse and beautifully made.